Zionist Union head Yitzhak Herzog says he's establishing "Zionist, centrist, rational bloc" to replace Netanyahu with or without elections. Zionist Union leader Yitzhak Herzog opened his party's faction meeting on Monday by referring to the coalition crisis regarding the dispute over the Israel Broadcasting Auithority's planned closure. 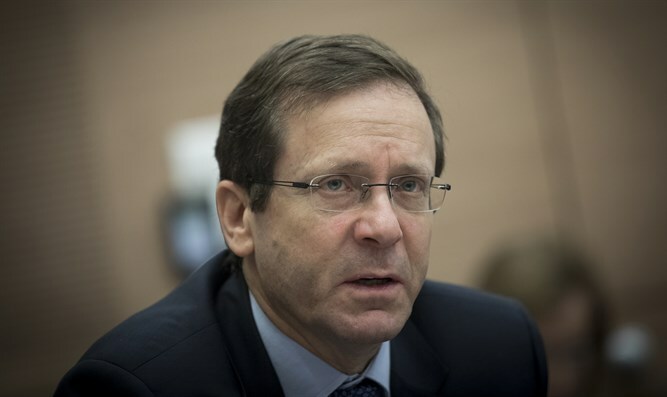 "Netanyahu's conduct in the last few days has been irrational and disproportionate," said Herzog. "In the south there are bombardments, in the north there are bombardments and in Jerusalem Netanyahu's communications cabinet is the only one working." "Netanyahu's obsession with the media, American pressure and his police investigations sets the tone," claimed Herzog. " The workers of the IBA don't interest Netanyahu. They were a tool for Netanyahu to incite against in the last elections when he called them 'Hamas terrorists' and they are a tool for him and his political manipulations now. The political establishment and the public are sick of a prime minister who acts according to caprices." Herzog said that "in the last few days I am working on building a Zionist, centrist, rational bloc which will replace Netanyahu after elections or in the present Knesset. I suggest to skeptics and cynics from outside and inside [the party] to wait and see. The unexpected in Israeli politics is far more prevalent than the expected." Herzog attacked Yesh Atid leader Yair Lapid for refusing to allow the replacement of the government without elections. "Yair Lapid initiated the idea of a constructive no confidence vote [in which the government changes without elections]. It appears in his manifesto and he needs to decide whether to act from personal interests or national interests. He will have to join such a no confidence vote if it will be presented." It should be noted that polls predict that if elections were held today, the Yesh Atid faction (11 in present Knesset) would gain 24-25 seats while the Zionist Union(24 seats) would get just 11-12 seats and this is the reason Lapid rejects the idea of a constructive no confidence vote. Herzog also demanded that the Attorney General prevent Netanyahu from being involved in the media due to his "crude and unseemly intervention in the control and function of the broadcasting corporation and the IBA." Herzog even threatened to petition the High Court over this issue. Herzog concluded by calling on Moshe Kahlon to leave the coalition and join an alternative government being formed.